The Lake Shore 8400 Series can be used with both DC and AC field Hall measurement methodologies to facilitate the broadest range of research applications. 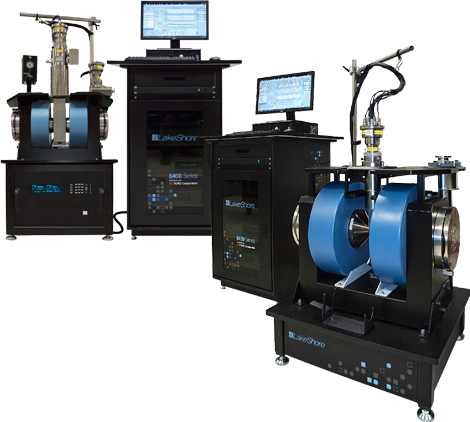 The system includes fully integrated instrumentation, a magnet and power supply, plus software that dramatically helps you increase your research productivity and provides results that you can trust. When used with the AC field measurement option, the system is ideal for use with emerging class of materials that typically have mobilities below 1 cm2/V s—the types of materials with electronic properties that can be difficult or impossible to measure with traditional DC field Hall methods. These include many contemporary semiconductor and electronic materials, such as photovoltaic (solar cell) and thermoelectric materials, new display technologies, and organic electronics. The standard system is capable of DC field measurements and has a resistance range from 0.5 mΩ to 10 MΩ. Measure Hall voltage, Hall coefficient, Hall mobility, and resistivity. With options added, the system allows you to measure down to 0.5 µΩ and as high as 200 GΩ in DC fields. You can also determine carrier density and carrier mobility versus temperature. For temperature-dependent applications, the 8400 Series options enable you to measure samples from 15 K to 1273 K with a closed-cycle refrigerator and high-temperature oven, or take dedicated 77 K measurements with an optional single-point LN2 body.